Lawmakers usually camp out in the same seat for hours every year in order to shake hands with the president when he enters the House chamber for the annual State of the Union address. But many lawmakers who have held the same seats for years will be abandoning their posts for Trump's first official State of the Union. WASHINGTON — Getting an aisle seat in the House of Representatives' chamber on the day the president of the United States delivers his annual State of the Union address comes with many perks, none more important than getting a quality picture of yourself shaking the commander in chief's hand at the biggest show on Earth. But scoring such prime real estate comes with a price. Securing an aisle seat requires the lawmaker to camp out in the old leather-upholstered chairs for several hours in advance of the speech — calling dibs is not allowed. It took tragedy to restore civility. Obama's address came just 17 days after a gunman fired on a congresswoman and her constituents at a gathering in Tucson, Arizona. Six people died and 13 were wounded, including Democratic Rep. Gabrielle Giffords, who was shot in the head. Images from the House chamber that night were haunting: Lawmakers wearing black-and-white ribbons in memory of the casualties. An empty seat to honor Giffords. And in first lady Michelle Obama's box, the mother, father and brother of Christina Green, a 9-year-old girl killed when she went to meet her congresswoman. That night lawmakers started a continuing tradition: some Republicans and Democrats now sit together for the big speech, instead of dividing into partisan camps. Giffords' bittersweet return was the high point of the next State of the Union. Frail but smiling, holding colleagues' arms for support as she walked into the chamber, Giffords was greeted with a standing ovation, chants of "Gabby, Gabby, Gabby," and a hug and kisses on the cheek from Obama. Ronald Reagan started the State of the Union tradition of inviting everyday Americans and telling their inspirational stories. Last year, a wounded war hero stole the show. "The practice of purporting to reserve seats prior to the joint session by placement of placards or personal items will not be allowed," reads a memo regularly read ahead of each joint session. "Chamber Security may remove these items from the seats. Members may reserve their seats only by physical presence following the security sweep of the Chamber." Lawmakers vying for the aisle seats has been a common practice for decades, pioneered by former Michigan Rep. Dale Kildee. "People would say, 'Gosh, I saw you shaking hands with the president.' So you had that advantage," Kildee told The Washington Post in 2013. 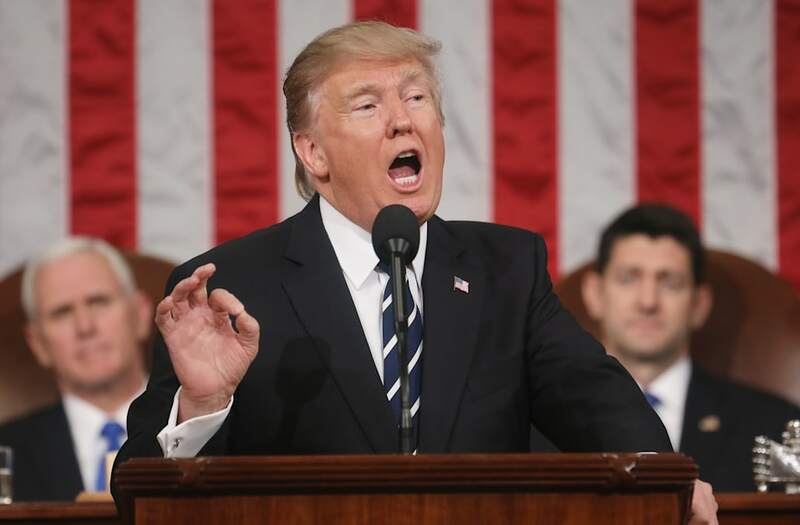 During President Donald Trump's address to a joint session of Congress last year, which was not technically a State of the Union but had all the bells and whistles of one, Republican Reps. Louie Gohmert and Billy Long staked out their seats more than four hours in advance, patiently waiting for the president to walk down the aisle and greet them with a handshake. Also during last year's address to the joint session, GOP Rep. Virginia Foxx of North Carolina asked Trump to autograph an item for her on his way out of the speech. But the polarizing presidency of Donald Trump is now upending the "aisle hog" caucus, leading some of the Democratic lawmakers — who have insisted on holding aisle seats during both Republican and Democratic administrations — to break their streaks. House Foreign Relations Committee ranking member Eliot Engel has repeatedly scored aisle seats in order to steal a handshake with the president. This year, Engel told Business Insider that he will not be taking the aisle. "I'm gonna be there for the speech, but I'm going to sit with my colleagues in the middle of the row rather than the aisle," Engel said. "I think that's the better way for me to be there. I think it's important to be there but I'm gonna be an average person." Another prominent Democrat known for holding the aisle is Texas Rep. Sheila Jackson Lee. Photographers have captured Jackson Lee shaking the president's hand at a State of the Union during every administration since she joined Congress in 1995. But this year is different. Like many Democrats, she is frustrated with Trump's policies and overall rhetoric. Jackson Lee told Business Insider on Wednesday she has yet to make a decision on whether she will even attend the State of the Union address. "I have no idea whether I'm going or not," she said. Trump's State of the Union may usher in a new class of aisle hogs like Long and Gohmert. But it is certainly changing the exclusivity of the best seat in the House.